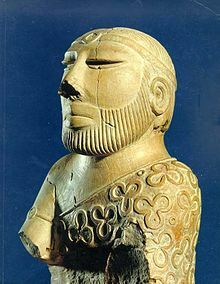 The history of the Ajrakh can be traced from the times of the ancient civilizations of the Indus Valley, around 2500BC to 1500BC. A bust of the King Priest excavated at Mohenjodaro shows a shawl — believed to be an Ajrakh—draped around his shoulders, which is decorated with a trefoil pattern (like a three-leafed clover) interspersed with small circles, the interiors of which are filled with a red pigment. The same trefoil pattern has been discovered in Mesopotamia, as well as on the royal couch of Tutankhamen. This pattern, which symbolises the unity of the gods of the Sun, water and earth, survives as the cloud pattern in the modern Ajrakh. The people of Sindh have a deep reverence for Ajrakh. From birth to marriage, until death, Ajrakh celebrates all significant events of the life cycle. 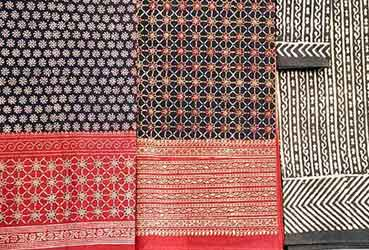 Ajrakh is worn as a turban, a shawl, spread as a bed-sheet or tablecloth and when worn out, it is recycled as a hammock for babies, cover for a bullock cart and most commonly used as a backing to patchwork quilts. It is used and reused till threadbare. It is worn by the wealthy as well as the poor — the colours, patterns and design-format remain the same, only the quality of the fabric is different. Design including square shape is most demanded and peculiar in itself. The resistant used also has a effect on the designs and patterns. The barmer prints are not used much for dress material but for furnishings. The bedsheets and bedspreads from Barmer are very famous and have a great market demand in and outside India. The use of cotton cloth as the base for dyeing makes these bedsheets more special.